This is a comfortable, warm, oversized women’s sweater that pairs beautifully with skinny jeans, leggings or other casual slacks. 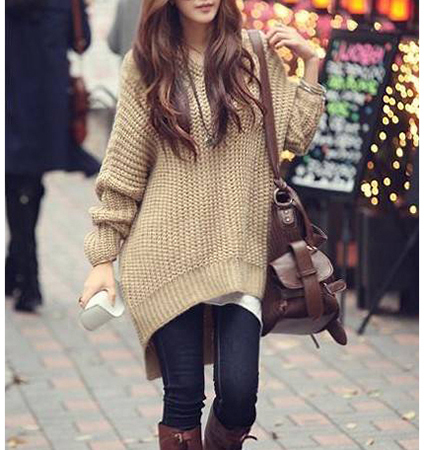 It is presented in a delicate sand color in a luxurious cable knit throughout. The sweater features a gently rounded neckline and has long sleeves. The asymmetrical hemline adds additional interest to the overall design. Its longer length is quite figure flattering. This sweater is machine washable in cold water. We recommend line drying or tumble drying on your dryer’s lowest heat setting. It is available for purchase in sizes Small, Medium, Large and Extra Large.